All rooms are plug in and play, with ground floor load-in. Supplied with vocal PA, guitar/bass amps & drum kit. We aim to make life easier! Roswell is an excellent “Work Space”. You could practice in your basement, or come here and get stuff done! Regulars often experience this Roswell phenomenon. Come and develop your music and stage technique. Need the world to see your band but maybe not your jam space? Roswell Rehearsals provides an excellent showcase and video/podcast recording location. Need a safe, neutral space to invite potential band mates to jam or audition? Look no further! 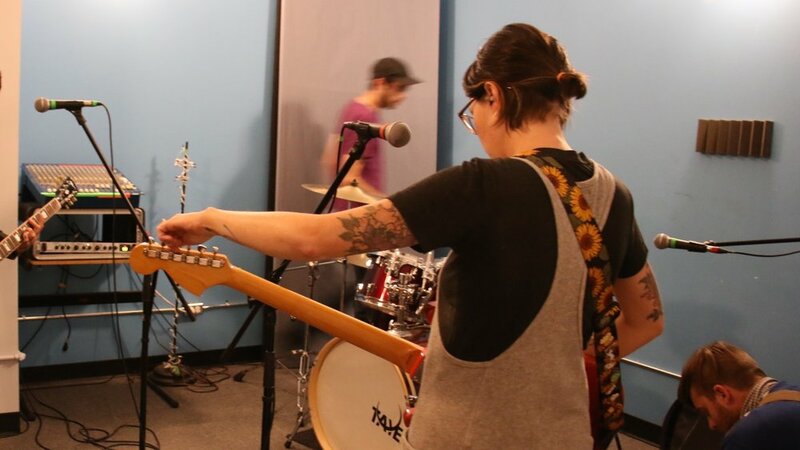 Roswell Rehearsals offers a unique space to make connections with others in the local music scene. One of the best things about what we do is seeing bands improve from week to week. Growing in confidence and skills! The only purpose built music rehearsal facility in Kingston, Ontario. We combine clean, comfortable surroundings with professional equipment for rehearsal and teaching use, or just to get loud with friends. We also provide space for auditions, filming promos, showcasing to industry pro’s and to practice stage technique. Ideal for Hobbyists, Students, Professional Musicians & Vocalists. All ground level, fully wheelchair accessible, with washrooms, accessory store, refreshments, lounge and free parking. Your space in the West End, combining professional attitude with the heart of a small business.